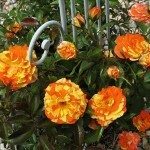 Blue & Black Roses: Do Black Roses Exist? Do Blue Roses Exist? The title of this article sounds like some scoundrel beat the dickens out of some roses! But put down your garden shovels and forks, no need for a call to arms. This is just an article about the black and blue bloom colors of roses. So, do black roses exist? How about do blue roses exist? Let’s find out. Is There a Such Thing as a Black Rose? So far there are not any rose bushes on the market that truly have black blooms and could qualify as a black rose. Not that many a rose hybridizer has not tried over the years or is not still trying to come up with one. The seemingly black rose names would have one conjure up mental images of a beautiful sultry black rose. *Well except for one that might have ones thoughts wander off to a certain pirate ship (Pirates of the Caribbean). Anyway, the black rose bush just does not exist yet and perhaps never will. What you will be able to get on the current market are deep dark red blooming roses or deep dark purple blooming roses that may indeed get very close to being a black rose. These near black roses are truly beautiful in the rose bed, too, I might add. Is There a Such Thing as Blue Roses? The blue roses names would have one conjure up mental images of a beautiful rich or sky blue rose. 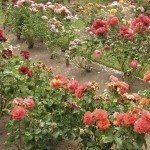 However, what you will be able to find on the market under such names are light to medium mauve or lavender blooming rose bushes, not true blue rose bushes. Some of these near blue roses will have their bloom color listed as lilac as well, which is misleading since lilac blooms can also be white. I guess since the names are a bit misleading, the color descriptions can be as well. The rose hybridizers will keep trying to get blue and black rose blooms I am certain. Sometimes this is attempted by mixing in the genes from other flowering plants, as the rose just does not appear to have the gene needed to produce a blue rose bloom. There has been word of a blue rose bush that was created in a hybridizer’s greenhouse; however, it was such a weak little rose bush that it quickly succumbed to disease and died in the greenhouse of its creation. The black rose bloom is just as elusive as the blue rose; however, it seems that the hybridizers have been able to get far closer to the black rose bloom. For now, the answer to the questions, “Do black roses exist?” and “Do blue roses exist?” is “No, they do not” but this does not mean we cannot enjoy the near colored roses that are currently available.